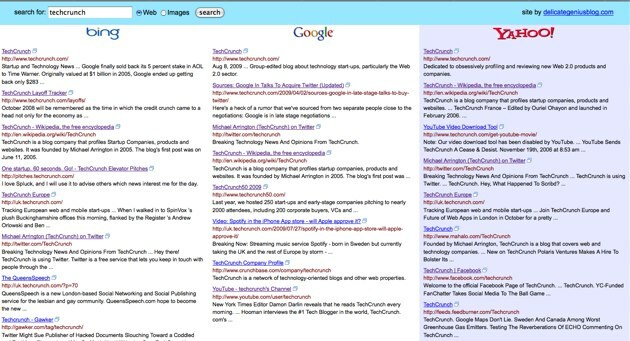 Which Search Engine Do You Choose In The Blind Test? Have you tried out this blind search tool yet? It provides results from Google, Yahoo and Bing in three columns but doesn’t tell you which column is which search engine. You then tell it which one you think shows the best results, and you then see which answers are from which engines. I keep choosing Yahoo as the best results. A few search engine experts we’ve spoken with over the years say that users tend to think Google results are better just because they’re from Google. If you take any search engine and put the logo on top, it tests better. So Yahoo results with a Google logo will always test better than, say, Google results with the Yahoo or Bing logo. People are just used to thinking about Google as the best search. This search tool strips out all the branding, so you’re forced to really think about which results you like better. And early results showed a much more even distribution than Google’s 70% market share would suggest: Google: 44%, Bing: 33%, Yahoo: 23%. The score keeping feature was removed when people found a way to game it, but you can still run the test against yourself and see which search engine you really like the best. Too bad the one I seem to like will shortly be mothballed. The tool was created by Michael Kordahi, a Developer Evangelist at Microsoft.